I’m currently not eating tomatoes or peppers as part of my 21-day “detox” experiment. The reason being that these vegetables, along with potatoes, eggplants and other vegetables of the nightshade family, are often rich in alkaloids that can be mildly toxic (so says Dr. Junger, who designed this detox, as does Ayurvedic medicine interestingly enough). This has been challenging because tomatoes and peppers were a staple of mine, and with the weather being unbelievably warm, summery and beautiful here in the UK for the last few days, I’ve been madly craving gazpacho. Last summer I tried Nigel Slater’s tomato gazpacho and absolutely loved it (the same recipe also led me to discover the joys of sherry vinegar). 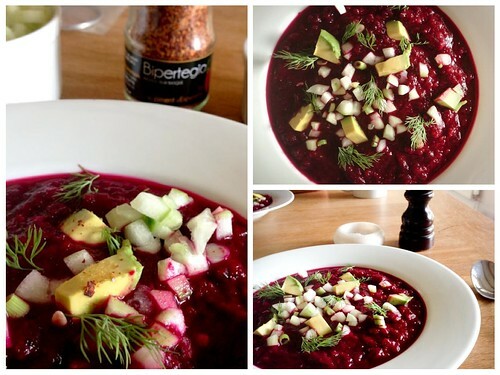 So this week I decided to try getting my gazpacho fix by using beetroot instead of tomatoes and peppers. The result, as Kanna put it, was “very special” and “exceptionally good” (I blush – Kanna does not deliver her compliments lightly). I followed the recipe pretty closely – I used three very large beetroot, cut back on the smoked paprika, omitted the sugar, upped the cucumber and added some fresh dill. The garnish: sliced spring onion, more dill and cubes of avocado. We sprinkled the avocado with Le sel au piment d’Espelette, salt with dried pimento chillies (one of my summer road trip acquisitions from Espelette – when in Basque!). As an added bonus, this soup also satisfied my craving for Cold Beet Soup, my Lithuanian grandmother’s family recipe where buttermilk (not detox friendly) is a key ingredient. 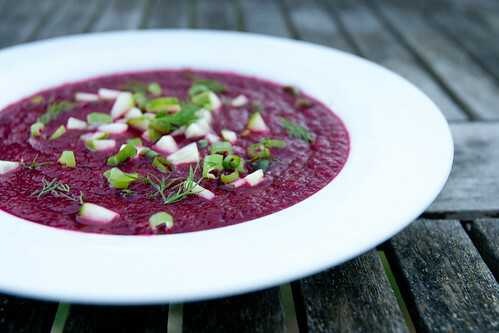 I almost hate to associate this soup with the detox, because it really stands alone as a delicious summer soup and a beetroot revelation. The only question I have is: have I created something new, or did I really just make borscht? Adapted from Nigel Slater’s [url href=”http://www.theguardian.com/lifeandstyle/2012/jul/15/nigel-slater-chilled-gazpacho” target=”_blank”]tomato gazpacho[/url]. Scrub the beetroot well, then cook in boiling water until they are absolutely tender (pike a skewer through them – it should go through easily and the beetroot should fall off the skewer). Let the beetroot cool then remove their skins. 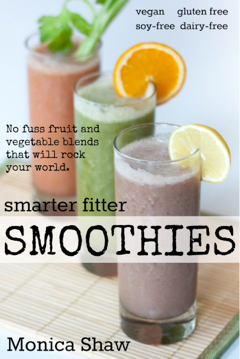 Now, get your blender ready. 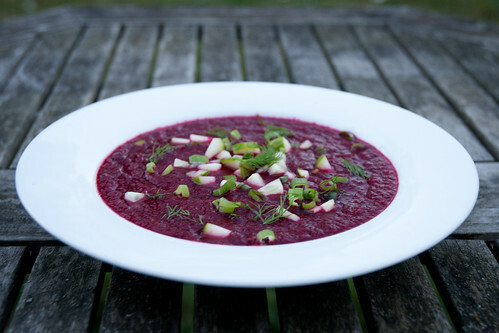 Coarsely chop two of beetroot, along with the red onion and cucumber, and add to the blender. Remove most of the green shoots (reserve for garnish) of the spring onion and add the white part to the blender, too, along with the garlic. Pulse until you get a soup that’s of the consistency you like – I like to keep it a little bit chunky. Pour the soup into a big bowl. Finely dice the last beetroot and add that to the bowl, along with the sherry vinegar, dill, smoked paprika, olive oil and a bit of salt. Mix well, then taste and add more vinegar, paprika, olive oil, dill and salt to your liking. Chill in the refrigerator for a couple of hours to let soup get cold and the flavours mingle.